Artichokes can be frozen after cooking, but not raw. Uncooked, they will turn brown upon thawing and taste pretty awful. Good luck! To prepare large artichokes for freezing one problem must be overcome. That is to penetrate the center so they need not be cooked completely, but rather blanched. To accomplish this, cut the stem off, cut off the top 1 inch or so, hollow out the center by smashing the thorny end against a counter top and scoop out the flower portions with a sturdy sharp spoon. Pour on lemon juice to help prevent browning. Make a small hole through the base to help heat penetration. Bring your water to a boil and along with your artichokes add more lemon juice, which is essential to prevent any bad discoloration. Hold the water temperature to just under a boil for 20 minutes. Remove and place in cool water to lower temperature. Drain and freeze. Place in plastic freezer bags to reduce freezer burn. Hopefully, this will be enough cooking to arrest the enzyme system but not enough to cause the artichokes to come apart. Upon thawing, the artichokes should be cooked an additional 25 minutes or so. Trim tops from artichokes. Rub cut surfaces with lemon. Cook artichoke “al dente” in water flavored with lemon juice. Drain upside down thoroughly. Place upside down on tray and freeze quickly in coldest part of the freezer. When frozen, place in plastic bags for storage. To thaw and cook: Wrap each artichoke in aluminum foil, sealed tightly. Place on rack above boiling water. Cover and steam until hot and cooked through. The secret here is to trim the baby artichokes (or small artichokes) to hearts, as shown in the basic preparation section. Make sure all the dark green is trimmed off. 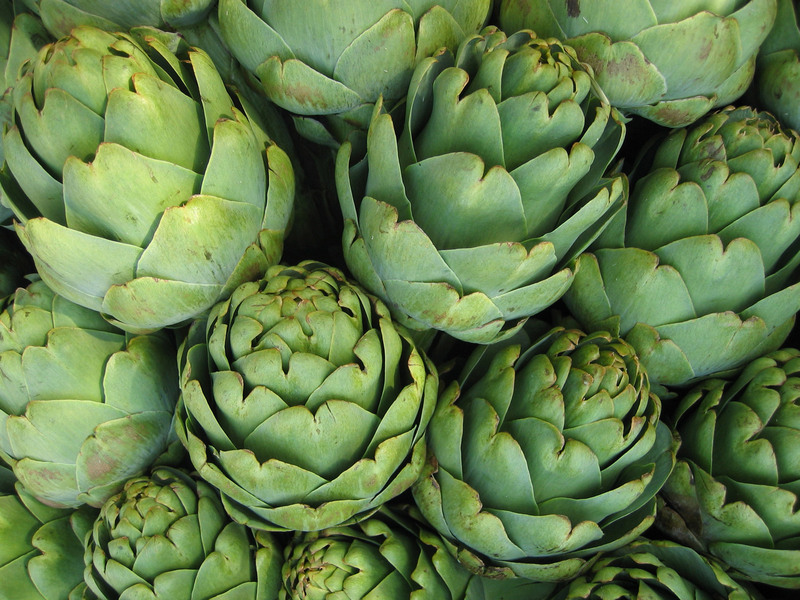 As you trim each artichoke, place it in water with lemon juice to help prevent browning. Once you have trimmed all the artichokes, place them in boiling water for about 10 minutes. Drain well, cool and cut each in half. Place them on a cookie sheet and freeze. Once they are frozen, put in a plastic bag and keep frozen. This system enables you to remove as many as you want and keep the rest frozen.